The recent threat to attack Israel, published by the Al-Qaeda linked terror organization “Al Shabaab al-Mujahidin” ("The Mujahidin youth”) is yet another indicator of the increasing global agenda of the Somali based “Al-Shabaab”. “Al-Shabaab” commander Abdifatah Aweys Abu Hamza was quoted (November 1st) saying "We will transfer and expand our fighting in the Middle East so we can defend Al Aqsa mosque from the Israelis". Al-Shabaab has also announced, with this regard, the establishment of a new unit, "Al-Quds brigade", designated to combat "the Zionist Entity". 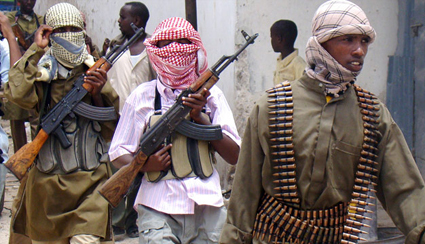 Unlike other terror and guerilla groups involved in the fighting in Somalia for the last two decades, the newly established (2006) “Al-Shabaab” has exposed several international dimensions within the framework of its terrorist activity since its formation. With this regard, “Al-Shabaab” included Western targets as part of its targeting policy and has already executed several attacks targeting NATO troops, Christian Missionaries as well as charity and aid western personnel that operate in the country. In addition, recent investigations held in different parts of the globe revealed that “Al-Shabaab” became the African Hub for Western Mujahidin, providing military training and combat experience for American, European and even Australian activists (for more information with this regard see our August article on Somalia's new role). Hence, the recent threat of Al-Shabaab to attack Israel should not be overlooked. Furthermore, one of the most skillful and admired commanders of “Al-Shabaab”, which was also one of the founding fathers of the organization in 2006 ,is Salah Ali Salah Nabahan, a Kenyan Al Qaeda activist that played an important role in the 2002 simultaneous attacks against Israeli targets in the Kenyan city of Mombassa (15 killed, among them 3 Israelis). Nabahan assembled the VBIED that exploded in “Paradise” hotel and personally pulled the trigger to launch an anti aircraft missile aiming at an Israeli passenger jet, which slightly missed the target. Nabahan was recently killed by American forces. Although “Al-Shabaab's” capabilities to launch attacks on Israeli soil are highly doubted, the possibility of using its pool of recruits that possess Western documentation to infiltrate the Israeli border screening process cannot be ruled out. Rather, we assess, with this regard, that “Al-Shabaab” will focus most of its operational attempts on Israeli establishments (formal and private ones) in its vicinity of operations in the “Black continent” as a whole, and the horn of Africa countries in particular.